Ernie found this image (not exactly sure where....sorry!) that we just had to share! 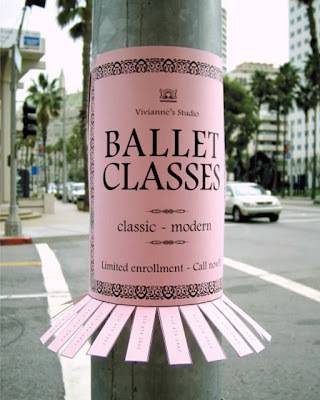 We have all seen them, you may have even posted a few, but none stand out as much as this posting for ballet classes. Taking a pirouette off the standard street posting, this dance studio played off the look of a tutu to grab your attention - very successfully we think. A great example of how a little creativity can add a lot to even the most simplest and budget friendly projects. have you seen my dog. copyright dreamscapes design group 2013. Simple theme. Powered by Blogger.